The Audubon Commission appeared before city officials on Thursday morning to repeat a request it made last year — $5 million over the next three years to help enhance the area around its upcoming lion exhibit. The money to acquire the animals themselves is generated by private fundraising, so money the Audubon Commission is requesting from the city is to pay for the holding and exhibit areas for the lions. 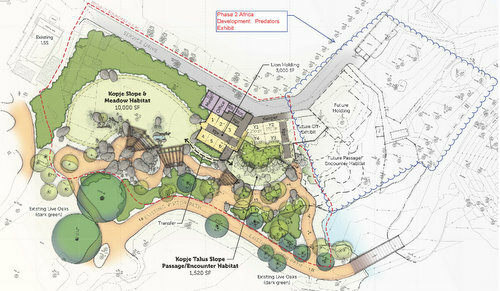 Specifically, the commission will spend the $5 million on “infrastructural upgrades to the oldest part of the zoo, significant erosion control at lagoons, animal exhibit upgrades to coincide with expectations of more stringent regulations from accrediting authorities, and an expanded education program with a more immersive guest experience,” according to the request submitted to the city. The request is divided into three years’ of allocations — about $300,000 in 2017 and about $2.35 million each in the two following years. The commission made a similar request last year that was not funded, but it is routine for city agencies to make the same request several years in a row until they receive funding. 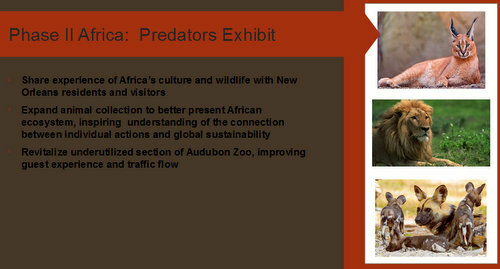 “This request is meant to fund the second phase of an ongoing redevelopment of ‘Africa’ to include holding facility, support spaces, infrastructure upgrade, associated signage and thematic nuance required to better educate about our full collection of African predator species animals in an immersive setting,” the request continues. In a separate request, the Audubon Commission is also seeking $3 million in upgrades to Woldenberg Riverfront Park along the Mississippi River in the French Quarter, to allow it to better host festivals and major events. Officials with the City Planning Commission are currently collecting budget requests from all the city’s departments for the next budget year. The commission’s recommendations will then become part of the process of writing the overall budget, a process that typically takes place later in the summer. No, no, no. We have real predators prowling our streets. Spend it on hiring more cops.